Engineered for ease of loading and handling. 2 wheels promote easy maneuvering and reduced stress on shoulders and lower back. Upright stance means loading is easier. This unique American designed and manufactured wheelbarrow will be the envy of the neighborhood. The Smart Cart™ will be last wheelbarrow you'll ever need to buy! Move Mulch in 1/3 the time. 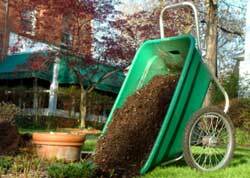 Great for transplanting shrubs and small trees...a versatile garden wheelbarrow. 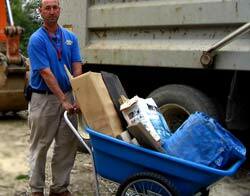 Having a yard sale: move nearly everything with this utility cart. 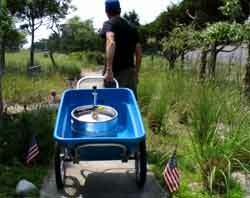 Use cart pan by itself to water and feed livestock, store kindling. This is the best, professional-grade wheelbarrow we've ever seen. It is made so well the pans have a five year warranty...the best in the industry. 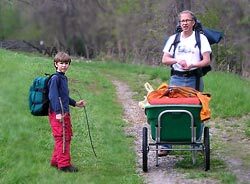 The patented snap-out pan design is what sets this versatile utility cart apart. Interchangeable pans in 2 sizes (7 and 12 cubic ft) mean you can change your pan size for your needs. Smart Cart's easy-to-roll two-wheel design is engineered for ease of handling, easy maneuverability and reduced stress on shoulders and lower back. 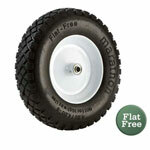 The wheels are also interchangable according to your needs. 7 and 12 cubic foot sizes, and are interchangeable & replaceable. Buy one frame and if you like have 2 sized pans. The pan snaps easily in and out of the carriage, and is often used by itself as a handy tub or container. Popular uses for the pan include baby pool, washing the dog, holding ice or water, feeding livestock, and covering wood and shrubs. pans have a five year warranty! pans : seamless high-density, polyethylene. - are leakproof, with no bolt holes to rupture, crack or tear. - Ultraviolet ray inhibitor added. is unaffected by water, strong sunlight, barn acids or fertilizer. tubular framework: aircraft-quality drawn aluminum alloy, satin-etched and anodized. strongest undercarriage in the industry. frame is exactly the same on all models and therefore the Standard pan of 7 cubic feet (200 litres) capacity and the Extra-large pan of 12 cubic feet (340 litres) are interchangeable. Lightweight and extremely strong, it will never rust or rot. rake into it, roll rocks into it, flip bags of mulch right in. save your back! no spills! This wheelbarrow design holds more volume for the tray size than other designs. 40-44 pounds. You can separate the frame and pan and lift easily. replaceable. interchangeable for your needs. 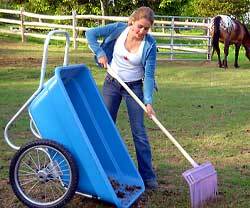 name change: for those of you in the horse industry, you will know that the smart cart wheelbarrow is also known as the Muller's Smart Cart. 20" dia. x 2" tread width. Maximum Load 600 lbs with 16" wheels. Is plastic really strong enough for a utility cart? Smart Cart is! Smart Cart tubs are made from advanced ultra-high-molecular-weight polyethylene (UHMWPE), a special thermoplastic with long-chain molecules that transfer loads more effectively to the polymer backbone. This exceptionally tough material has the highest impact strength of any thermoplastic you can buy. It’s ultra-resistant to corrosive chemicals and has a coefficient of friction so low (comparable to that of Teflon®) that it’s called “self-lubricating”! It’s also 15 times more resistant to abrasion than carbon steel and is nontoxic. Needless to say, our UHMWPE tubs dramatically outperform wooden, steel, and lesser plastic cart tubs. The Smart Cart frame looks light. Is it tough enough for the job? Absolutely! 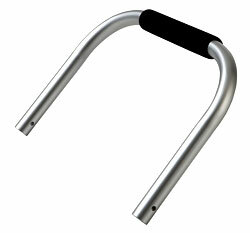 The frame is handcrafted from 6063-T832 aluminum alloy for light weight and superior strength. Then it’s satin-etched and anodized for good looks and maximum weather resistance. The undercarriage—the sturdiest in the business—features a solid steel axle housed in a steel brace running from wheel to wheel under the frame. This special construction method is stronger than other attachment methods and cannot be torn from the frame. Yet a finished Smart Cart weighs less than 48 pounds. At Smart Carts, quality is in the details, too! 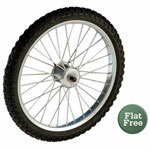 The wheels have extra-heavy spokes, replaceable sealed bearings, and have never collapsed in three decades in business. Replaceable skid plates on the frame protect the legs from wear. (You won’t find this attention to detail in some of our competitors’ carts.) The hardware nuts are self-locking so the frame won’t loosen over time. How good is the Smart Cart warranty? It’s the best in the business! The lifetime warranty covers all parts of the cart’s framework against cracking, breaking, or bending. The tubs are warranteed for 5 years. Smart Carts are built with interchangeable parts for easy upgrades and repairs, and all parts are available separately. You can’t lose! Please call us or email with any warranty questions. Is a Smart Cart worth the cost? Our customers say, “Yes!” Sure, a lesser cart is okay for light work—for a little while. But if you’re a serious rider, stable owner, gardener, nursery owner, or marina owner—anyone who wants real value in a workhorse—you’ll want “the right tool for the job.” The real question isn’t how much a Smart Cart costs up-front, but how long it keeps on giving. When you do the math, the cost per year of a Smart Cart beats that of any other utility cart on the market. And unlike old-fashioned wooden or rusty steel carts, your Smart Cart won’t fall apart and need maintenance and repairs year after year. All SmartCart Wheelbarrows include a best in the industry 5-year warranty on the pans.